The poor old cauliflower so often taking stick in the British press. Apparently, sales are falling, and one of the reasons attributed to this is because some say it is boring. How can anyone call this lovely vegetable boring defeats me? 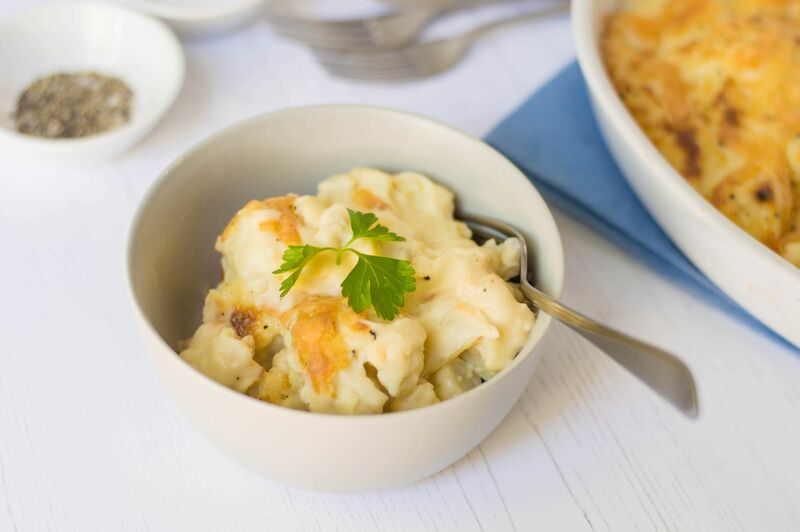 Cauliflower is a staple of British food, and no roast dinner would ever be complete without a dish of bubbling hot Cauliflower Cheese as just one example of how tasty and versatile it is. Those who speak about cauliflower in that way need to check out some of these ten delicious recipes for cauliflower and then tell me it's boring! A dish of golden, bubbling cauliflower cheese is one of great favorites of British and Irish Food. It sits alongside the British National Dish of Roast Beef and Yorkshire Pudding, makes a great topping for a baked potato and frankly is delicious all on its own with a big hunk of crusty bread. All in all, British food would not be the same without this classic dish however you choose to eat it. Nigel Slater is one of Britain's favorite food writers, his recipes are usually straightforward yet with stunning results. This recipe for fried cauliflower is not just an inventive use of the lovely cauliflower, it is also quick and easy to make. You can serve the cauliflower and salsa as a main dish or use in smaller portions of the fried cauliflower as a side. This recipe is one way to simply and easily elevate the humble cauliflower to new heights. The dish is not just easy, it is also a relatively cheap dish using chicken thighs and a cauli. This curry makes a great main meal when served with rice, chapattis or Naan bread. Cauliflower is such a great vegetable for a soup as it purées like a dream once cooked. There are many recipes which make the most of the underrated vegetable. Match the cauliflower up with healthy broccoli, a touch of mustard and a little cheese to create a filling soup. The soup will be sufficient to eat as a main course or a smaller portion for a starter. I can't think of anything better on a cold winters day. Some years ago, we discovered an amazing recipe for cauliflower rice. It is super simple and this one comes from Stephanie Kirkos, Gluten Free Diet Expert, we love this rice, it not only makes a fabulous 'rice' if you are on a restricted diet, it is simply delicious with no diet required.